Clinical features and MRI appearance of PCL mucoid degeneration and intercondylar ganglion cyst. Department of Radiodiagnosis, Sarojini Naidu Medical College Agra, Uttar Pradesh – 282002. India. Joint Replacement and Arthroscopy Surgeon OJAS Clinic, E-8, Tanki road, Kamla Nagar, Agra, Uttar Pradesh – 282004. India. Introduction: Mucoid degeneration and Ganglion cysts arising from the posterior cruciate ligament (PCL) of the knee are rare. The aetiology, clinical features and Magnetic resonance imaging (MRI) appearance of PCL mucoid degeneration and intercondylar ganglion cyst are discussed. Case Report: We present a 36 year-old male patient who presented with chronic right knee pain for the duration of 5-6 months. No evidence of ligament instability on clinical examination was found. A diagnosis of PCL mucoid degeneration and intercondylar ganglion cyst was made on MRI. Conclusion: Mucoid degeneration and ganglion cyst involving PCL are uncommon lesions and represents the spectrum of same pathology. MR imaging is sensitive, specific, accurate and noninvasive, while providing multiplanar imaging and superior identification of the anatomical and morphological relationship of the synovial tissue to the surrounding structures, an additional intra-articular lesions can also be detected. Keywords: Ganglion cyst, mucoid degeneration, intercondylar, posterior cruciate ligament. Intra-articular ganglion cysts especially those arising from the cruciate ligaments are very uncommon, with a reported prevalence of 0.2%–1.3% on MR imaging[1,2] and 0.1%–0.6% on knee arthroscopy[1,2]. Posterior cruciate ligament (PCL) ganglion cysts occur less frequently than those arising from the anterior cruciate ligament (ACL). 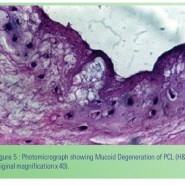 Here we describe a rare case of mucoid degeneration of PCL with intercondylar ganglion cyst. Mucoid degeneration of cruciate ligaments is a rare process that has been discussed in few reports. Pathogenesis of mucoid degeneration is unclear and is thought to be related to repeated trauma. Ganglion cysts have also been attributed to mucoid degeneration in the connective tissue from which they arise. In 1924, Caan  first described the anterior cruciate ligament ganglion during a routine dissection. Currently, two theories relating to the pathogenesis of ganglion cysts exist, although the true cause is still unknown [4-6]. The first theory attributes the presence of ganglion cysts to being a product of mucinous degeneration of the connective tissue [6,7]. The second theory considers it a cause of herniation of synovial tissue through a defect in the joint capsule or tendon sheath, similar to those of wrist joint origin [4,8]. For both theories, the relationship to previous trauma is uncertain and has not been documented. Mucoid degeneration and intra articular ganglion cysts of knee are rare lesions. These lesions are predominantly incidental findings on MR imaging and arthroscopy. Most commonly mucoid degeneration and ganglion cyst involves ACL than PCL. Brown and Dandy found that only six of 35 ganglion cysts arising from the cruciate ligaments were from the PCL , similar to the findings of Bui-Mansfield and Youngberg, where eight of 23 cruciate ligament ganglion cysts arose from the PCL and those of Krudwig et al, where only 16 of 49 cruciate ligament ganglion cysts arose from the PCL. Intercondylar ganglion cyst are seen within or extending from the intercondylar area. They contains thick, sticky, clear, colourless, jellylike material. These cysts are often associated with mucoid degeneration of cruciate ligament with degenerative cysts at its attachment. Kaatee et al. described how long-standing pressure of a ganglion cyst against an adjacent hard surface may produce an indentation through gradual erosion of the bone, creating an intraosseous ganglion. The high incidence of intraosseous ganglia in patients with either mucoid degeneration of the cruciate ligament or intrasubstance cruciate ligament ganglia suggests that these two entities may share a similar pathogenesis.Ganglion cysts of the cruciate ligaments are usually asymptomatic, and are often hard to diagnose clinically due to the lack of specific symptoms and signs. Symptomatic patients may present with pain aggravated with flexion or activity, increased pain during posture change, locking, clicking or popping sensations, and a decreased range of motion. Ganglion cysts arising from the PCL may impinge between the ligament and the intercondylar roof, limiting flexion through mechanical block. Because the intercondylar notch is relatively spacious, it may take time for the mass to develop into a size large enough to cause symptoms. Mucoid degeneration on MRI shows a relatively maintained outline of cruciate ligament, increased girth compared to normal, T1 intermediate/hypointense and T2 intermediate/hyperintense signal intensity, normal orientation of the ligament, and “celery-stalk” appearance. Ganglion cyst may appear fluid-filled, with low T1 and high T2- and proton-weighted signal, and could be sharply demarcated with homogeneous appearance. Ganglion cyst may occur either in the substance of the ligament extending into intercondylar area or at the attachment site leading to intraosseous expansion. Mucoid degeneration and ganglion cyst involving PCL are uncommon lesions and represents the spectrum of same pathology. MR imaging is sensitive, specific, accurate and noninvasive, while providing multiplanar imaging capability with its attendant advantages. Superior identification of the anatomical and morphological relationship of the synovial tissue to the surrounding structures is possible, and additional intra-articular lesions can also be detected. Though rare, the diagnosis of mucoid degeneration of cruciate ligament of knee has to be kept in mind in a patient presenting with knee pain, especially in terminal flexion and extension, without significant history of trauma. Imaging-guided percutaneous aspiration of cyst contents should be considered initially for symptomatic patients, with arthroscopic surgery reserved for patients that do not respond satisfactorily. 1. Loder RT: The demographics of slipped capital femoral epiphysis: An international multicenter study. Clin Orthop Relat Res 1996;322:8-27. 2.Murray AW, Wilson NI. Changing incidence of slipped capital femoral epiphysis: a relationship with obesity? J Bone Joint Surg . 2008;;90B:92-94. 3. Aronsson DD, Karol LA. Stable Slipped Capital Femoral Epiphysis: Evaluation and Management. J Am Acad Orthop Surg 1996 ; 4:173-181. 4. Aronsson DD, Loder RT, Breur GJ, Weinstein SL. Slipped Capital Femoral Epiphysis: Current Concepts. J Am Acad Orthop Surg 2006 ;14:666-679. 5. Wells D, King JD, Roe TF, et al: Review of slipped capital femoral epiphysis associated with endocrine disease. J Pediatr Orthop 1993;13:610-614. 6. Poussa M, Schlenzka D, Yrjönen T. Body mass index and slipped capital femoral epiphysis. J Pediatr Orthop B. 2003;12:369-371. 7. Brown D: Seasonal variation of slipped capital femoral epiphysis in the United States. J Pediatr Orthop 2004;24:139-143. 8. Morrissy RT. Slipped capital femoral epiphysis technique of percutaneous in situ fixation. J Pediatr Orthop. 1990 ;10(3):347-350. 9. Nguyen D, Morrissy RT. Slipped Capital Femoral Epiphysis: Rationale for the Technique of Percutaneous In Situ Fixation. J Pediatr Orthop. 1990 ;10(3):341-346. 10. Samuelson T, Olney B. Percutaneous pin fixation of chronic slipped capital femoral epiphysis. Clin Orthop Relat Res. 1996 ;(326):225-228. 11. Schultz WR, Weinstein JN, Weinstein SL, Smith BG. Prophylactic pinning of the contralateral hip in slipped capital femoral epiphysis : evaluation of long-term outcome for the contralateral hip with use of decision analysis. J Bone Joint Surg Am. 2002 ;84-A(8):1305-1314. 12. Ilchmann T, Parsch K. Complications at screw removal in slipped capital femoral epiphysis treated by cannulated titanium screws. Arch Orthop Trauma Surg. 2006 126(6):359-363. 13. Ward WT, Stefko J, Wood KB, Stanitski CL. Fixation with a single screw for slipped capital femoral epiphysis. J Bone Joint Surg Am. 1992 ;74:799-809. 14. Karol LA, Doane RM, Cornicelli SF, Zak PA, Haut RC, Manoli A 2nd. Single versus double screw fixation for treatment of slipped capital femoral epiphysis: a biomechanical analysis. J Pediatr Orthop. 1992;12:741-745. 15. Lee TK, Haynes RJ, Longo JA, Chu JR. Pin Removal in Slipped Capital Femoral Epiphysis: The Unsuitability of Titanium Devices. J Pediatr Orthop. 1996 ;16:49-52. 16. Van Valin SE, Wenger DR. Value of the false-profile view to identify screw-tip position during treatment of slipped capital femoral epiphysis. A case report. J Bone Joint Surg Am. 2007 89:643-648. 17. Riley PM, Weiner DS, Gillespie R, Weiner SD. Hazards of internal fixation in the treatment of slipped capital femoral epiphysis. J Bone Joint Surg Am. 1990 ;72:1500-1509. 18. Gopinathan NR, Chouhan D, Akkina N, Behera P. Case report: Bilateral femoral neck fractures in a child and a rare complication of slipped capital epiphysis after internal fixation. Clin Orthop Relat Res. 2012 ;470:2941-2945. 19. Chan G, Chen CT. Musculoskeletal effects of obesity. Curr Opinion Pediatr. 2009 ;21):65-70 author please follow a single style in page numbering, eg 31-7, or 31-37, do not mix up styles. 20. Warner JG, Bramley D, Kay PR. Failure of screw removal after fixation of slipped capital femoral epiphysis: the need for a specific screw design. J Bone Joint Surg Br. 1994 ;76:844-845.